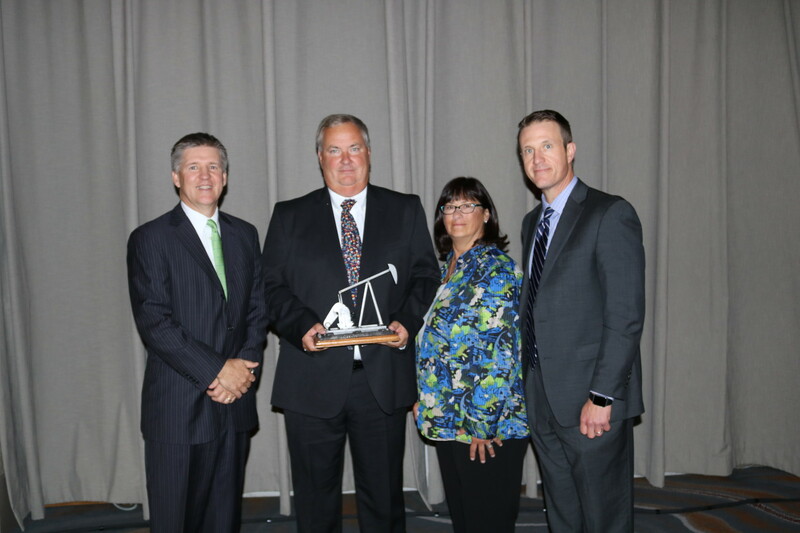 Bismarck, N.D. – During their Annual Meeting on September 25, 2018, the North Dakota Petroleum Council was pleased to announce the induction of Terry Kovacevich into the NDPC Hall of Fame. 2017 Hall of Fame Inductee, Craig Smith, presented Terry with his Hall of Fame Award. Terry started with Marathon Oil Company in 1978. During his 37 ½ year career, he held various positions including: Operations Manager, Asset Manager and Regional Vice President. This included nine years working international assignments. Terry is a native of the Cleveland, Ohio area and graduated with a Petroleum Engineering degree from Marietta College in Ohio. The last 10 years of his career were spent in North Dakota leading Marathon’s Bakken activity. Terry’s world-wide experience was a tremendous benefit in managing Marathon’s Bakken assets in western North Dakota. Through his leadership at Marathon and as the Chairman of the NDPC, Terry was very active in the community and state. He attended many county commission and tribal meetings to ensure he understood their challenges. Terry was one of the leading forces behind NDPC’s Oil Can! program which was focused on being part of the solution to the Bakken challenges and working with the local landowners, public officials and communities. The Bakken Cookfest was Terry’s idea, the first Cookfest was held in Kildeer in July 2008. Since then, Cookfests have been held in 20 Communities across western North Dakota hosting nearly 25,000 participants and is a nationally award-winning oil and gas education and outreach program. This is just one example of the leadership Terry Kovacevich brought to North Dakota throughout his decade of service. “Terry’s commitment to doing the job right and always trying to build positive relationships left an impression and footprint that NDPC is continuing to carry-forward daily,” said Craig Smith, 2017 Hall of Fame inductee. Terry served as Chairman of the NDPC board and as a member of the executive committee. He is a member of the Society of Petroleum Engineers. He was a member of the industry advisory board for the Petroleum Engineering Program at UND, energy committee chairman for fundraising for the new hospital in Dickinson, industry advisory board member for the Williston Safety and Technology Center, and supported other organizations always reflecting positively on the oil industry.